THERE was no punching the air, gritting the teeth or swearing under the breath. No wild title predictions or talk of winning a 'cup final' (take note Alvaro Arbeloa). That's because for Jamie Carragher, winning at Chelsea is exactly what Liverpool should be doing. Don't get me wrong, the 1-0 win, which ended Chelsea's magnificent 86-game unbeaten record at Stamford Bridge, was a good win - a great win, even. And, of course, there are lots and lots of plus points to take from the game. The positive attitude, the coolness, the calmness, the number of chances carved out and the passages of fluid, passing play. Add to that the performances of Carragher, Daniel Agger, Steven Gerrard, Javier Mascherano, Xabi Alonso and Albert Riera - and, importantly, the fact that this wasn't a Houllier-esque 'bus parked in front of the goal' performance. As I say, plenty to be positive about - and I haven't even mentioned that we're unbeaten and top of the league. Or that we didn't have Fernando Torres. But all that aside, it's important not to get carried away. And with Carragher around, there's not much chance of that. You can tell he's a manager in the making. Because while Gerrard clenched his fist and muttered 'Yes' through gritted teeth as he marched off the pitch, Carragher wiped the sweat from his brow, took Nicolas Anelka out of his pocket, and swigged a bottle of water. But he didn't need to. His body language did it for him. 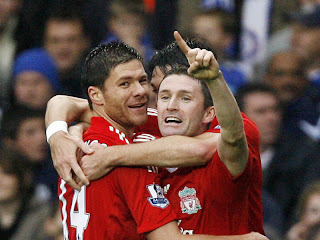 To Carragher, it's three points. It's nice, but it's three points. And now it's on to Portsmouth at Anfield on Wednesday. Where, let's be honest, anything less than a win would be a major disappointment. Typically, Rafa Benitez was in the Carra camp, too. 'Does it change anything?' he was asked. 'No,' he replied. 'One game at a time'. Couldn't agree more - bring on Pompey!